Let's be honest: we didn't want Jesse Marsch to come here. Mike Petke's inexplicable firing still seems as nonsensical now as it did three and a half years ago. And when Marsch started his tenure by comparing the club to an energy drink... we didn't think it will end well. Well, we were wrong. During his tenure with Metro, Marsch proved to be an intelligent, adaptable coach who instituted a clear style of play, making the team a contender during each season. Yes, there were problems along the way, and a tendency to over-manage, but when all is said and done, he was the first head coach in team history to make it to Year 4. Of course, he didn't end Year 4, as we expect the imminent announcement that he will be joining Red Bull's European family in some capacity. 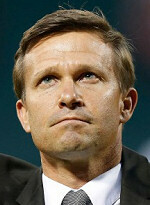 Clearly, it would be idiotic to pass a head coaching job in a major European league, even if it is for only a year. That being said, we're disappointed in how it ends. So, perhaps it doesn't end well; Marsch's body of work, as good as it was along the way, is not completed. Now it will be up to Chris Armas to finish it. Will he carry on Jesse's legacy of fall face first? We fill find out soon. We didn't want Marsch to come here... now we don't want him to leave.